Yesterday morning I woke up with a flower mandala in mind after laying it out in my dreams. This isn't it. I'm still working on that one. This one side tracked me. 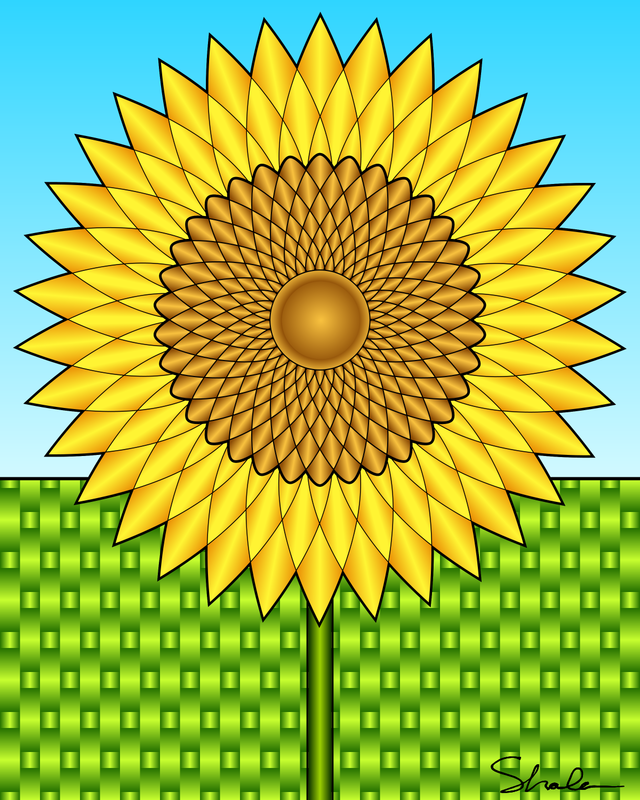 Sunflowers are Fibonacci number flowers with 34 petals. 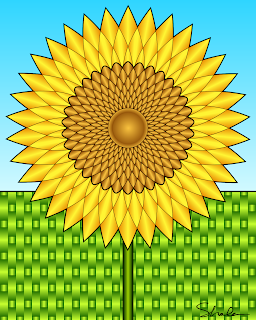 I thought about adding some leaves, but I really like how it looks without them. Click on the image for the big version. Next week I should be getting a shiny new high capacity stapler, so I was planning to put together a few side stapled coloring books of my mandalas as presents for non-internet friends. So I'll be posting a tutorial for that when it gets here. Tomorrow, the hardware store and farmers market. Michael and William were discussing 3rd hands and magnifiers and other things for the things he paints. He paints miniatures and squirt guns. The squirt guns turn out pretty neat looking. It's amazing how some metallic paints turn a bright, plastic cheap squirt gun into something very steampunk looking. I'm planning to pick up a bolt cutter for my 12 gauge copper wire, and hopefully some pickling cukes for the dill that's growing like crazy in my herb garden. The herbs are doing so well. The basil didn't come up at all, but I'm set for cilantro, dill and parsley! Actually, since my husband has herbs growing in his office, we have too much cilantro. Love the images! I'm going to have my kids color the B&W one since we're learning about Fibonacci in homeschool.